It had come to my attention several times lately that the Cherokee had some deficiencies when it came to hauling things. While there is plenty of space inside for luggage and regular personal stuff, it just didn't cut it when it came time to make a trip to Home Depot or Lowes for project materials. When GM announced their "Employee Pricing for Everyone" (GMS) sale, I began to seriously consider a vehicle change. The only class of vehicle that really appealed to me at this time was a midsize pickup truck. The compacts are a little too small and the fullsize are just too big (it has to fit in my driveway!). And I also wanted to get something with gas mileage at least as good as the Cherokee (24 on full highway trips and average of about 20.5 for me). I also rarely need the full capacity of a pickup and I don't tow heavy trailers. I also really like the ability to carry 3 passengers, even though I don't do it often. 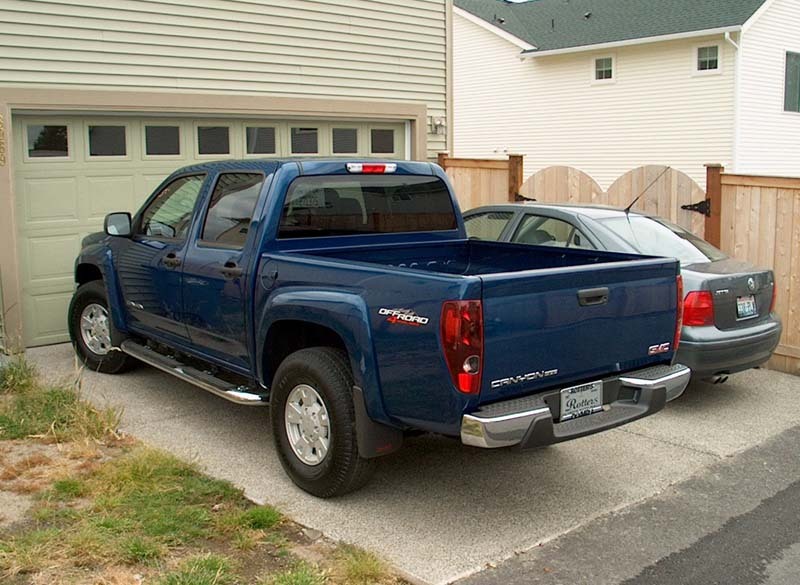 Extended cab trucks don't fit real people in the rear, but the newly popular Crew Cab 4-door trucks do! 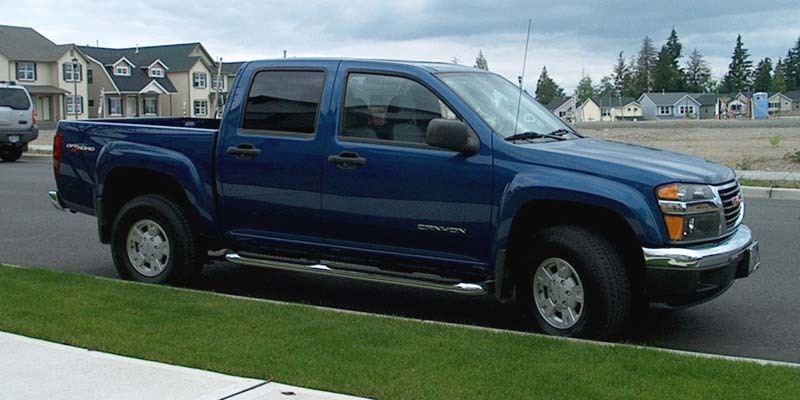 My field of candidates included the Toyota Tacoma Double Cab, the Dodge Dakota Quad Cab, Nissan Frontier Xtra Cab and the Chevrolet/GMC Twins Colorado and Canyon. I REALLY don't care for the looks of the Nissan or the Dodge and neither gets very good gas mileage. 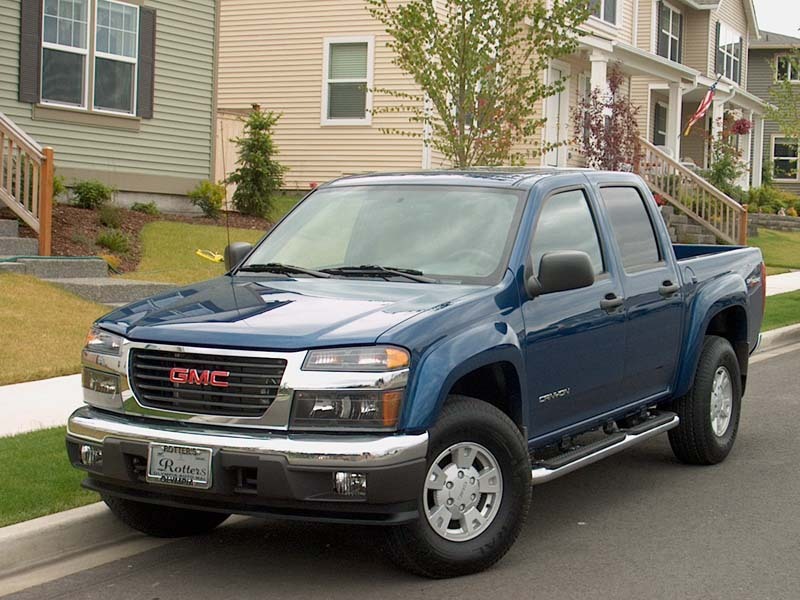 I looked at both the GMC Canyon and Toyota Tacoma. The Toyota is is Motor Trend's Truck of the Year and Toyota has a great reputation for reliability and longevity. However, it rides like a truck and did not like the noise level or pulling feel from the engine. It also runs several thousand more than the GMC for even a less well equipped truck. I really like the look of the Canyon and it has a couple of features and options that I particularly like. One is the availability of leather seats with power adjustments and heat for BOTH front passengers. I also got a power sunroof! The interior is very comfortable and even the rear seats hold adult riders adequately and children fit very well. The fuel mileage rating is 17 city and 22 highway, which is greater than the Cherokee (rated 15/20). The inline 5 cylinder engine makes 220 hp and 225 ft-lbs of torque. Towing capacity is only 4,000 lbs, but I didn't buy it for heavy towing (although I did get a towing package). The cargo bed is a shortbox at 5 ft. 1 in., but has an excellent feature for carrying large/long items (like 4 x 8 sheets of plywood)--the tailgate can be let down to a 55 degree angle to support sheets laid on top of the wheel wells! Nice! And what pushed me over the edge of the Canyon was the price! MSRP is pretty high for a little truck (it is actually not any larger than its predecessor the S-10/Sonoma) at $32,000 well loaded. But with the GMS pricing and a $2,000 rebate, my truck ran just $25,318! I was all set to buy on Friday (June 24th), but the first dealership I shopped (Hiatt Pontiac GMC) would only give me $10,000 for the Cherokee. This and the salesperson's attitude made me take a walk. The next day, though, I tried another dealership in Olympia--Rotters. They were willing to give me $11,500 for the Jeep and had an identical Superior Blue Metallic Canyon, so the deal was struck. I had already arranged my financing through USAA so the sale was smooth and hassle-free. The accessories I purchased need to be ordered and installed, so the truck is factory stock now. 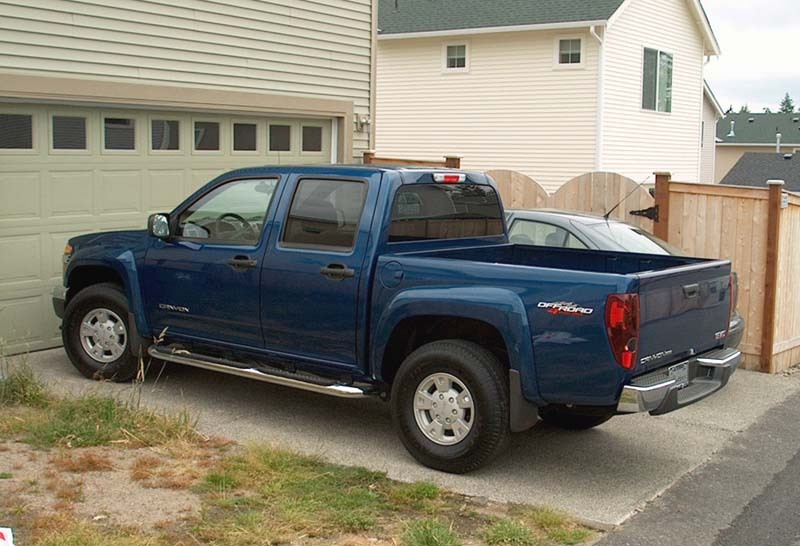 I also ordered the following accessories that need to be installed: trailer hitch and wiring harness, GMC-logo soft tonneau cover, Bed-rug bed protector and Bed Extender rails. In the next picture you can clearly see one of the reasons I did not want a full-size truck. There's no more room in the driveway for anything longer!